I love Valentine’s Day! My husband and I got married the day after Valentine’s Day 18 years ago, so it’s truly my favorite holiday. I don’t necessarily love the commercial side of it, but I do love a holiday that celebrates love and happiness. We spend the evening with our kids and always make something really special for dinner. One of my favorite things is dressing up the table for our special Valentine’s Day dinner. 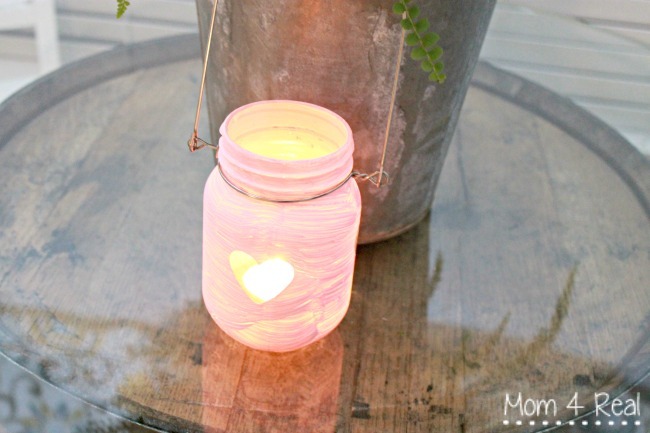 This year, I wanted to make some cute Mason Jar Lanterns to decorate the table with! 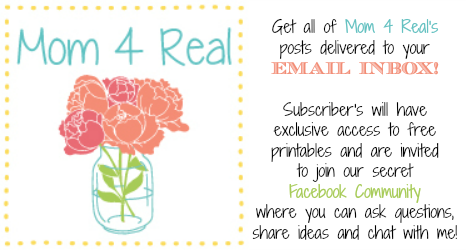 Be sure to check out some more amazing Valentine’s craft ideas from some of my bloggy friends at the end of this post! I started with some generic glass jars that I bought at Walmart. I like these for this project because they have no writing on them. Next, I placed some heart stickers around the jar. I used a heart punch and vinyl to make the heart stickers, but you can totally use regular heart stickers. 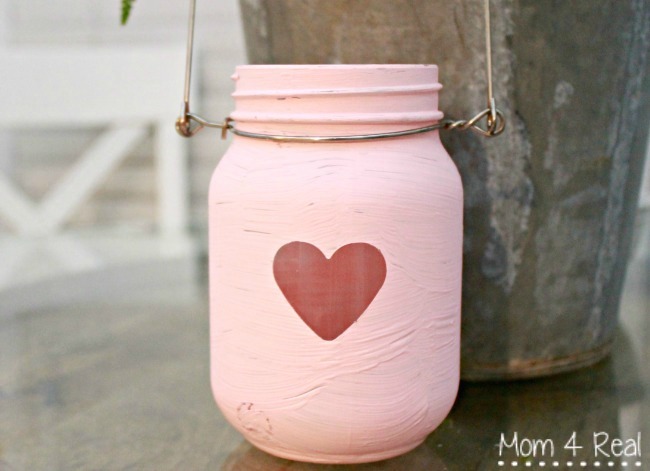 Next, I painted the entire jar with pink chalky paint and let dry. I wanted mine to look really shabby, so I only painted one coat on and used a whispy paint brush. 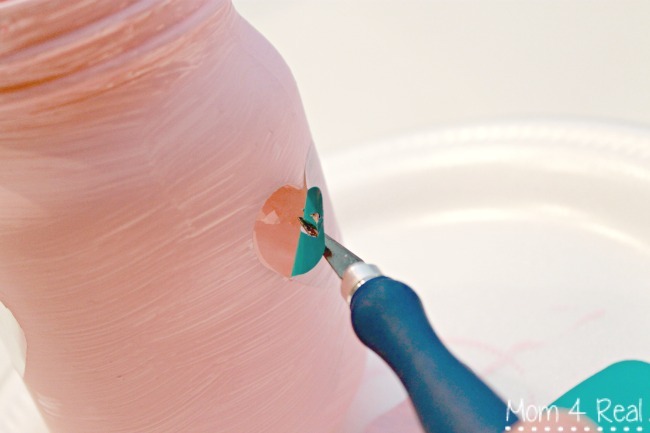 Once the paint is dry, use a sharp knife to remove the stickers. I used a Mason Jar Lantern Kit that can be found at most grocery stores in the canning section to make it look like a real lantern. You can hang them or just leave them as is. Pop a tea light or votive in the jar and light…how cute is that? 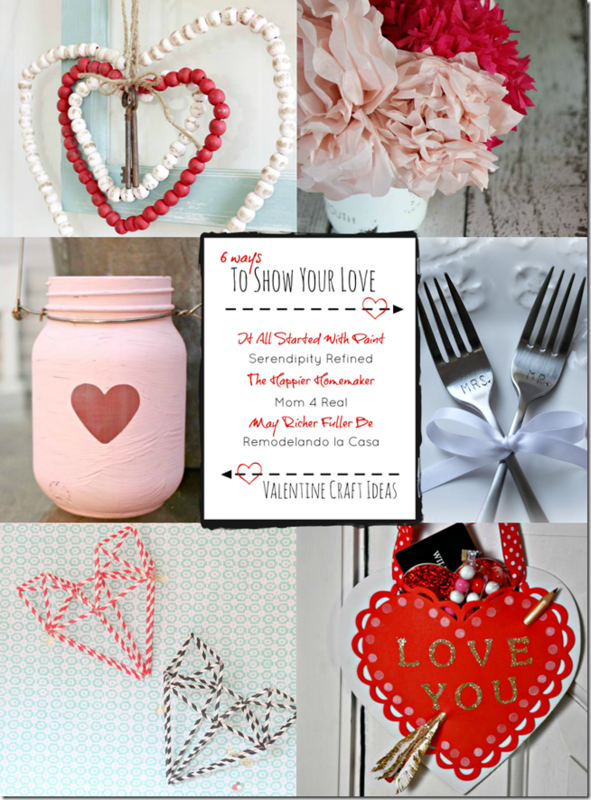 I can’t wait to dress our table up for Valentine’s dinner! Some other blog friends of mine have are also sharing some super cute Valentine’s craft ideas…you can find them below! 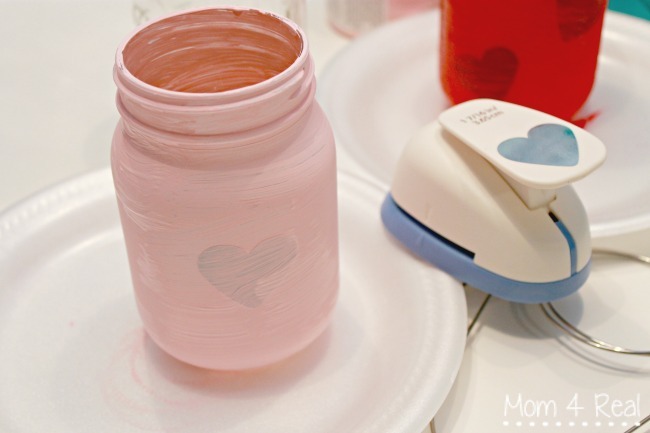 You know my heart skips a beat when I see a mason jar craft project! 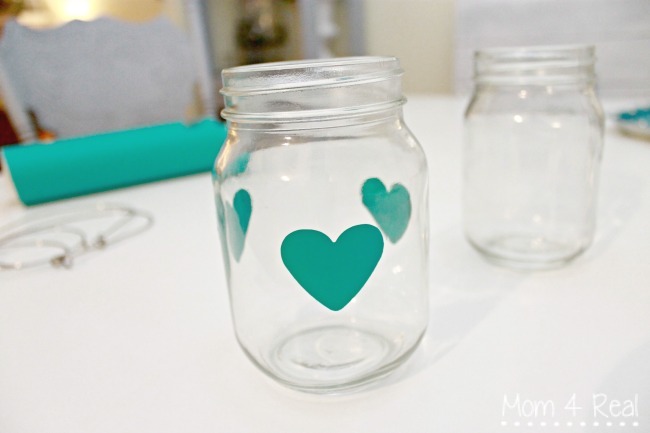 Just love your adorable heart cut out jars. A perfect addition to your V-Day dinner table! So happy to be ‘sharing the love’ with you today! Such a cute project! Can’t wait to see them adorning your V-day table!